"A gem of suspense… an entertaining read." "Quick, sure images, tight storytelling, solid suspense. A tense and vivid tale." "Fascinating history and assured storytelling make The Chrysalis one of those rare thrillers that both entertain and intrigue. This is a terrific debut!" "Flemish art, Nazi skullduggery, and American money–in The Chrysalis, Heather Terrell follows the path of a famous painting through an important period of history that must not be forgotten, and interweaves the stories of three centuries into a dark cocoon of intrigue and suspense." "Only someone who feels a real love for art and the power of justice could have written a book like this." "[The Chrysalis] builds in intensity to an exciting climax. Rich details about the art-auction business and case law are woven throughout this fascinating debut." 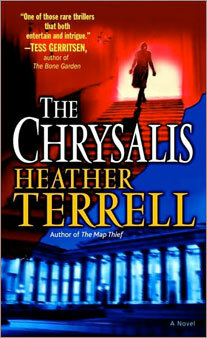 "Part mystery and part legal drama, The Chrysalis is a noteworthy, dramatic debut from an impressive author." "Heather Terrell carefully uses her knowledge of law, art, and history to provide the reader with an entertaining story…Nothing is ever as it seems." "The author educates as well as entertains her audience at a level anyone who is not a lawyer or an art student can understand…Extremely well done." "Lawyer turned author Heather Terrell employs her vast legal experience in this engrossing debut thriller…The result is a compelling, fast-paced mystery filled with twists." "Think The Da Vinci Code meets Girl with a Pearl Earring…[An] accessible, fast-paced romp through the upper crust of the collecting wolrd."